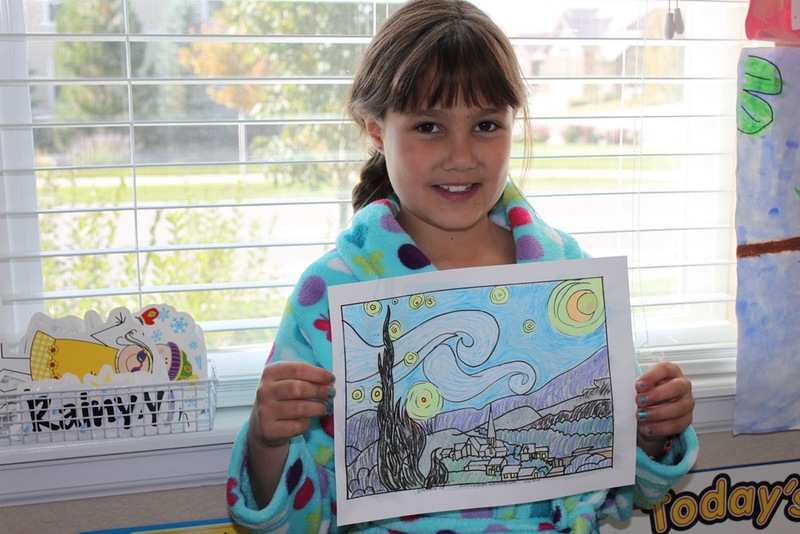 Welcome to our World’s Greatest Artist study on Van Gogh! Vincent Van Gogh was born in 1853 in the southern Netherlands. He had many jobs, but was most noted for his work as a Dutch post-impressionist painter. He was known for the emotional impact created by the use of brush stroke and intense color in his art work. Van Gogh’s thoughts on art are recorded in hundreds of letters he exchanged with his brother Theo, an art dealer. It was not until after his death in 1890 that his works became famous. 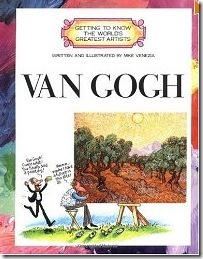 Today he is widely regarded as one of history’s greatest painters and important contributor of modern art. We took a few lessons to read through the Vincent Van Gogh World’s Greatest Artist series by Mike Venezia. Then we went back through and studied each of his art pieces individually. We discussed color, and technique along with style and mood. 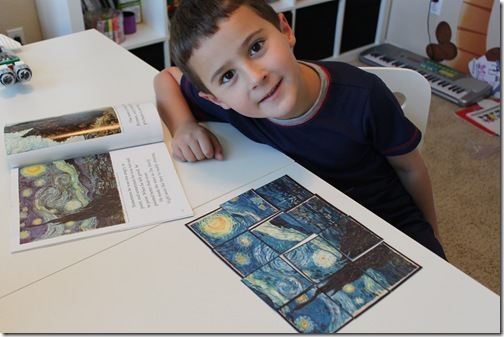 We also did a puzzle of The Starry Night (Avail. in my artist study download above). 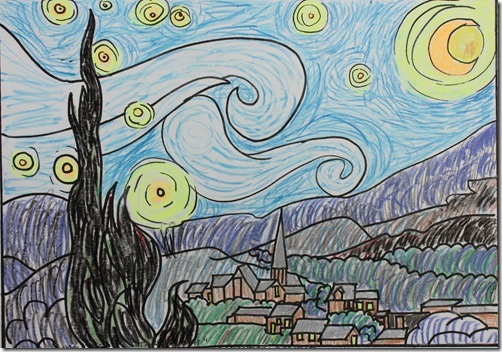 Once we took some time to go over The Starry Night, we decided to take our turn at trying to emulate Van Gogh’s style ourselves. 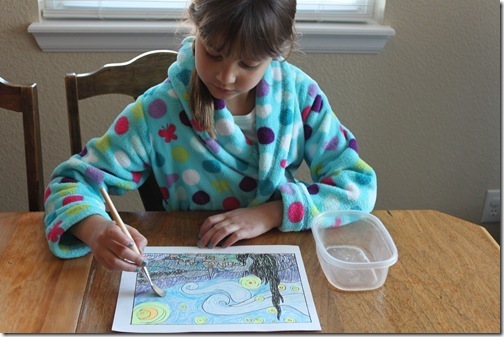 Since this was a fairly detailed painting I downloaded the Van Gogh Starry Night Outline from the Practical Pages blog, it was quite helpful for the kids to be able to focus on technique instead of trying to also figure out how to replicate the image as well. Here was our finished painting. 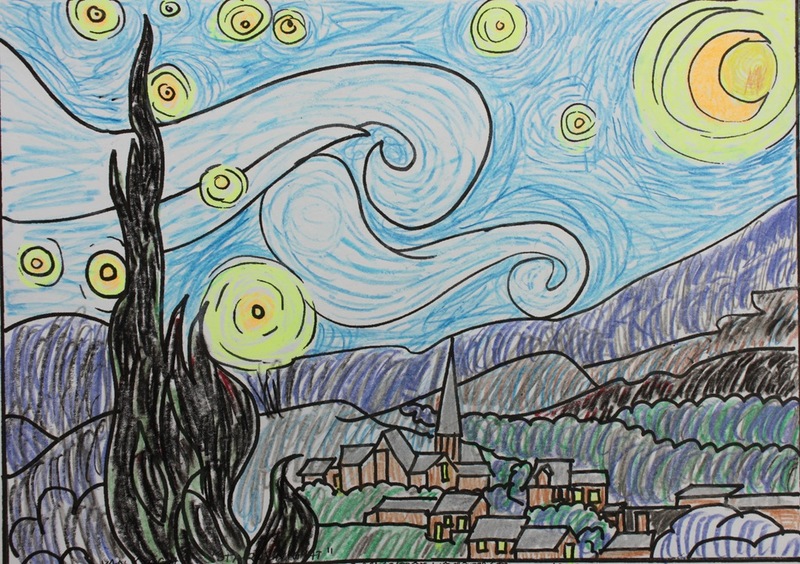 The moon, stars and trees were done using crayon, then the rest was the water-color pencils. The water wash blends the pencils, but is resisted by the crayon providing a fairly cool effect. 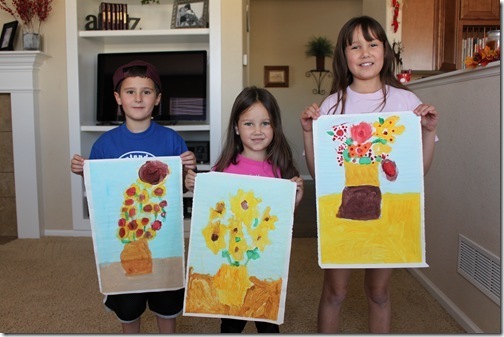 They definitely got to see how tedious all those little strokes that you can see in Van Gogh’s art can be! It must have taken great patience to paint using this technique. 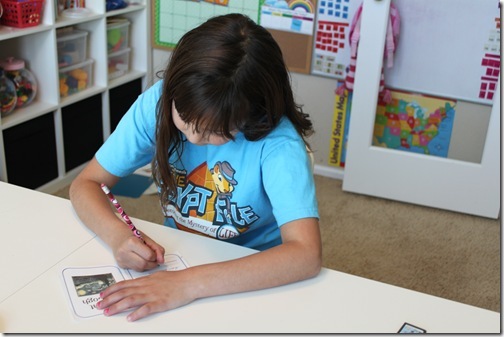 After that we filled in our artist flash-card then added it to our lap book for safe keeping. We’ll review these flashcards as we go. We also added all the artwork to our Van Gogh mini-book then put that in our lap book as well. 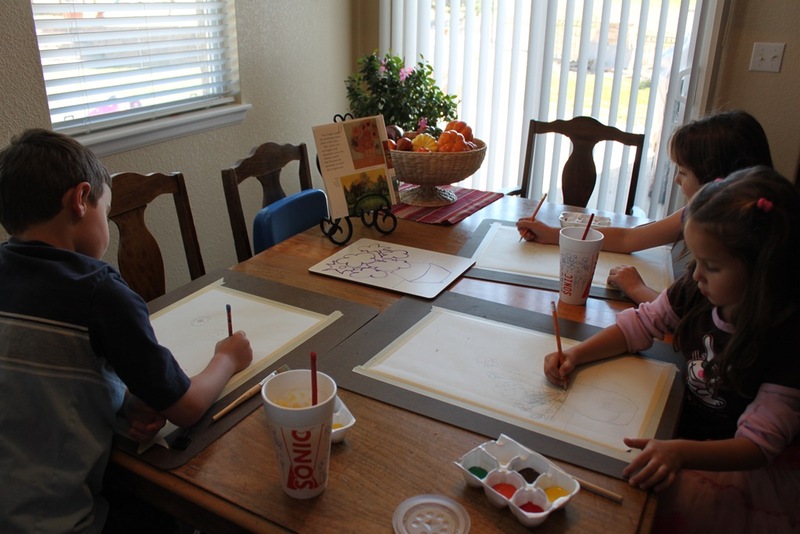 We also brought our book in so they could see the Sunflowers painting as they were working. 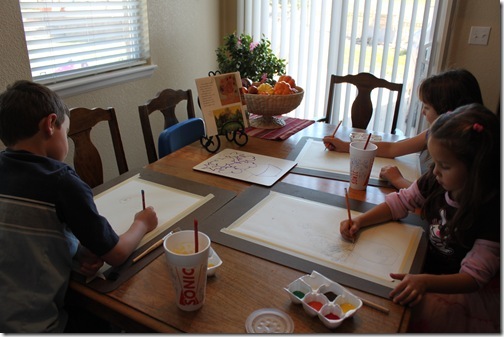 First they sketched their idea on the paper, then they were allowed to paint it. I was happy to see Turbo enjoying this process. 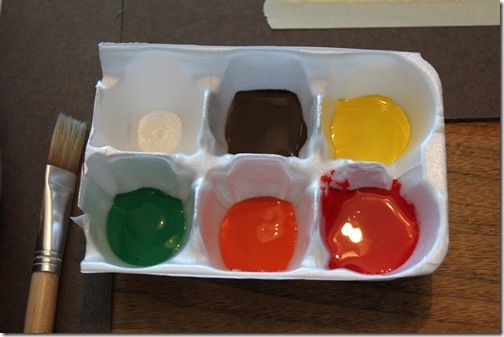 He’s a great color-mixer, and I loved seeing how he came up with his mixes. Tinker Bell was very careful in her work, being she’s only 5 I was impressed with her patience and attention to detail in this activity. Here are our finished pieces. I think they did a great job overall! 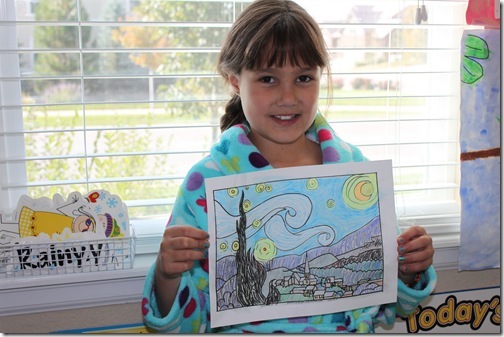 And that wraps up our study of Van Gogh! 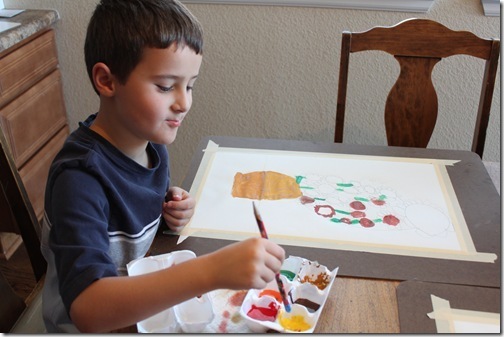 Up next we’re getting into works of Jackson Pollock next month! I’m sure paint will be a flyin’! If you’d like to join us in our World’s Greatest Artists Vol. 1 study, just click on the image below! What wonderful art! 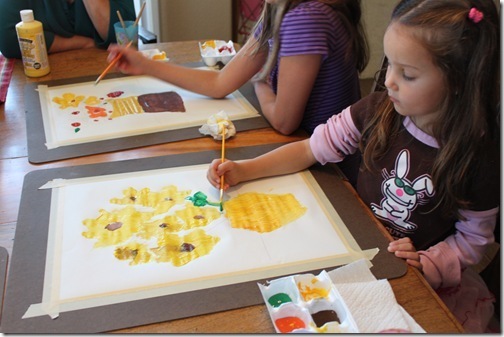 I love the way you tape their paper to a lovely big board and those sunflower paintings are stunning! Frame-worthy! LOVE IT! Growing up as a Missionary Kid in Europe my Dad always took us to art museums. I know I didn’t always appreciate it then, but at least now I can appreciate art. At least most of it. =-) Thanks for your free lapbook – we are using it too. We just wrapped up our Picasso study. http://livinglifeintentionally.blogspot.com/2011/10/picasso.html – if you want to check it out. Thanks again Erica!! My boys are so going to love this study when we start it next month! Thanks a million for all the work you put into it and offering it for everyone to enjoy!!! As a former art teacher, I love what you’re doing! 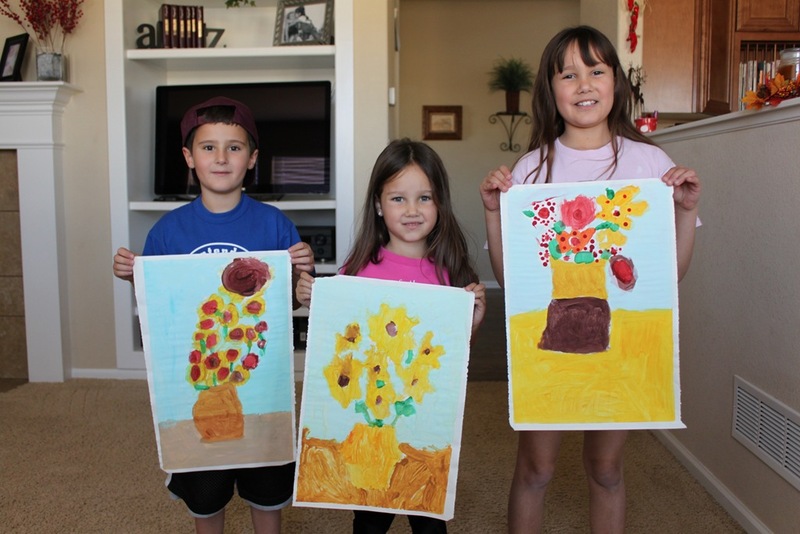 Your children’s work is wonderful. 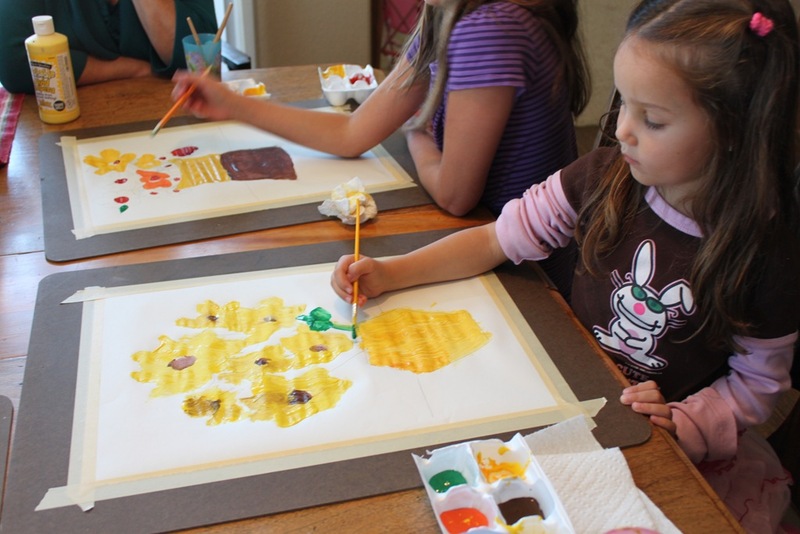 I love children’s art. Great idea. What a fabulous job that they did!!! I love this study you created. I just haven’t had time to implement it yet. 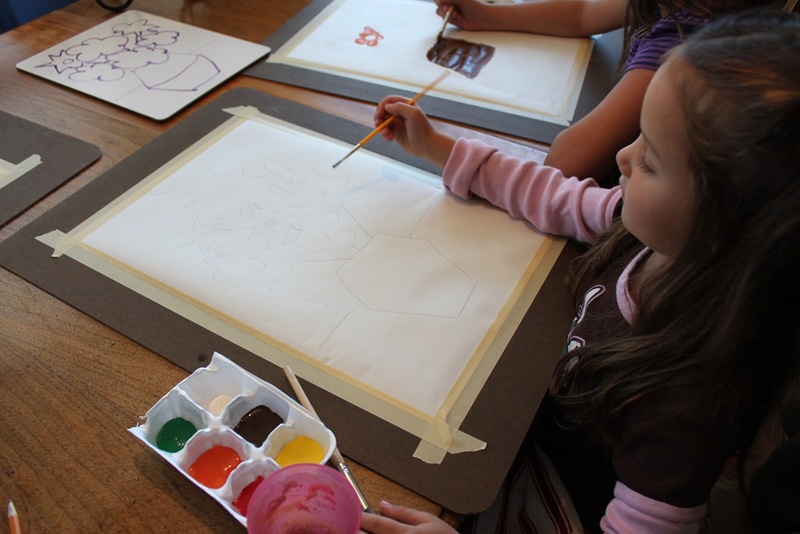 Love the art curriculum. Thank you for all you do! 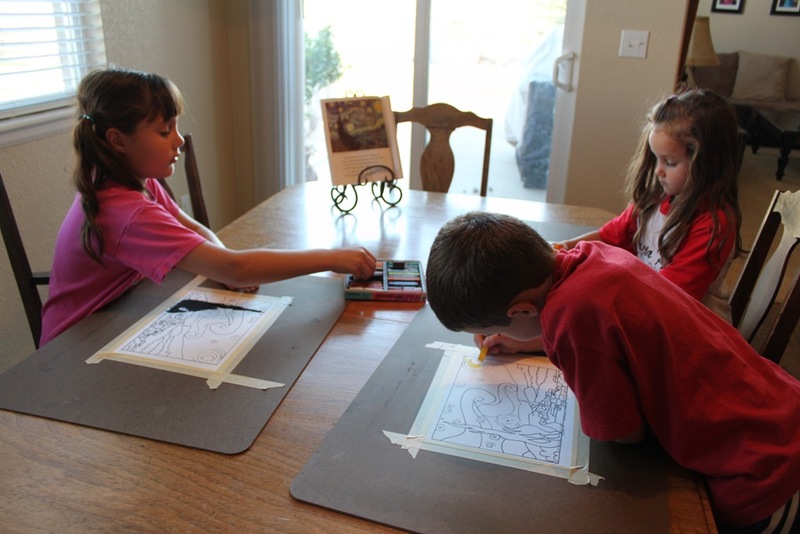 Where did you get those fabulous art boards? I NEED those! They’re actually the back side of some plain masonite chalk boards. I found them at Office Depot I think. I downloaded the artist study and haven’t used it yet. I am noticing you have lapbooks and such, is that included in the download or something separate you did? 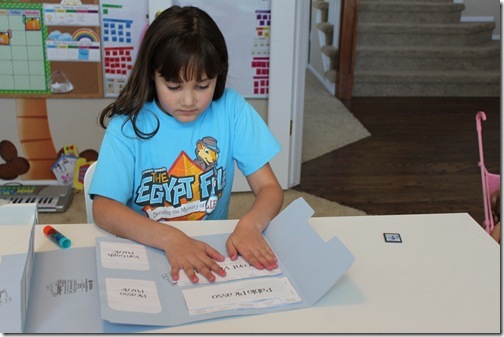 I’d love to get my hands on the files for the lapbooks and other pieces. Julie: YES! Everything’s included in the download, lapbook stuff, puzzles, artist cards, etc! 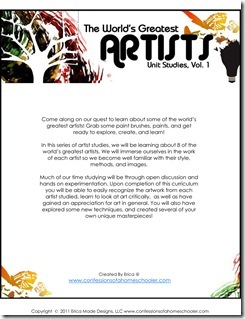 What a great art curriculum. We have been reading through an Usborne Art book but these lapbooks would be a great compliment. An off topic question: I was planning on ordering some of the ten drawer carts like you mentioned you use for your homeschool. I clicked on your link to JoAnns for the carts. There were quite a number of poor reviews on the carts so I thought I would ask you how they are holding up for your home school use. Some reveiws said the drawers did not hold anything bigger than 12×12. Others said that the drawers are flimsy and don’t stay on track. I’m sure your carts and drawers get a great workout with your children using them daily so before ordering I want to be sure this will last and hold materials for each school day. Thanks. I also love the art boards and have them on my list of things to look for at HD. Also, what type of tape do you use to hold down the paper? It looks like masking tape, but I would think that would rip the paper when removed. Is it painter’s tape?